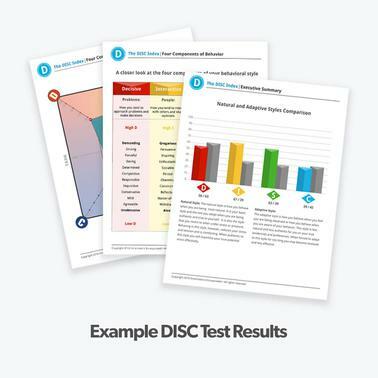 The DISC Personality Test is a tool used by millions of people to help them understand their communication styles and improve teamwork. Dave has used DISC Personality Test within his company for years. This test helps Dave’s team members understand how they communicate as individuals and how they can best work together as a team. Dave is now providing this valuable test for teams in every setting, from churches and organizations to businesses and schools--even families and individuals! Each of us is uniquely designed. We all have different strengths and weaknesses. We think, work and respond differently to challenges. But most of us probably haven’t given much thought to our communication style. Yet understanding why we do what we do is central to our success. The DISC Personality Test is a self-assessment that offers a proven and accurate summary of your communication style. The DISC Personality Test uses a quadrant graph, placing you somewhere within four distinct personality types. It's easy to use and administer. You'll simply answer a series of questions as honestly as possible, and the results are delivered in a detailed report. NOTE: This item includes a quantity of one personality test and accompanying report. This in-depth personality test cannot be reshared or reused. The DISC Personality Test will give you a picture of your communication style, how you work, and how you relate to others. Those around you will also understand how you operate and how they can better relate with you. You'll recognize your strengths and weaknesses, preferred surroundings and how you respond to rules. Discover what causes you stress and why you respond to conflict in certain ways. Learn how to adapt to enjoy healthier relationships with others. You'll also grasp how you solve problems and what motivates you in order to help you increase performance and personal achievement. If you lead a team, the DISC Personality Test is essential in helping you know who to hire and how to develop a stronger sense of team unity. It's as beneficial for churches, schools, universities, families and individuals as it is for Fortune 500 companies. Whatever the quantity you order, we will provide unique links for you to distribute. To make the distribution process simple, if you order a quantity of five or less, you will receive five separate emails with instructions and single codes you can forward directly to each person taking the assessment. If you order six or more assessments, one email will have a list of codes you can cut and paste into emails for your team. When you purchase a voucher item, you will receive an email after completing your order. In this email you will be provided both a link and a unique online access code. To access your product, click on the link and enter your unique voucher code when prompted.